Upon consideration of the interpretive theory, usage of which is not only accepted, but generally encouraged, it appears that “reading” is a process of creating meaning(s) in a text, rather than one akin to a game of literary hide-and-seek. One could argue that the “true” meaning of any text is that which its author intended it to have, but the measure of how far an interpretation could stray from this “true” meaning while still remaining acceptable remains unclear. This is because the author of a text will never be able to completely free it from ambiguity. A woman says, “I’m getting cold feet.” Are her feet literally getting cold? If she’s walking around the UC Berkeley campus on a rainy day wearing flip-flops, chances are, that’s what the sentence would mean. What if she’s about to get married, and is talking to her bridesmaids? In this context, it’d be safe to assume that “cold feet” is a metaphor for anxiousness. A single phrase could be taken as reasonable under multiple conditions, and distinct situations may have their own “literal” (plain and obvious) meanings for any particular text. These “literal” meanings may seem specific to their respective situations, but the source of any interpretation will always be the interpreter. Applied on a larger scale, the aforementioned concept of plurality in interpretation could be demonstrated in John Milton’s Samson Agonistes. This play has been interpreted as both including and not including Jesus Christ, despite containing no explicit mention of Him. Samson Agonistes’ lack of a narrator proffers readings based on character interactions. Not unlike how people “read” interactions on a daily basis, those reading Milton’s play would likely form interpretations of the text with regard to their own dispositions and preconceptions of the characters’ actions. The two readings of Samson Agonistes could be the result of interpretations formed by two general communities: those that read occurrences as functions of Christ, and those that do not. Though limited by context, the act of interpretation spans much further than “what the author meant.” This implies a sort of freedom in interpretation, where anything goes so long as it’s explained well enough. Literature classes are generally associated with textual analysis and “close reading,” both of which attempt to interpret a text in order to find a sort of common ground between text and reader. The problem with assigning these analyses, generally seen in high-school-English-class-literary-analysis-complete-with-explication-of-literary-devices, is that the task of “finding” meaning in a text could cause an overinterpretation of it, in which the attempt to explain an author’s intention leads to an excavation of his/her work that goes much deeper than necessary. A potentially excessive analysis could be justified simply by virtue of a reasonable common ground between text and reader; e.g., the Harry Potter series in the hands of a staunch Marxist may reasonably become an example of capitalist propaganda. 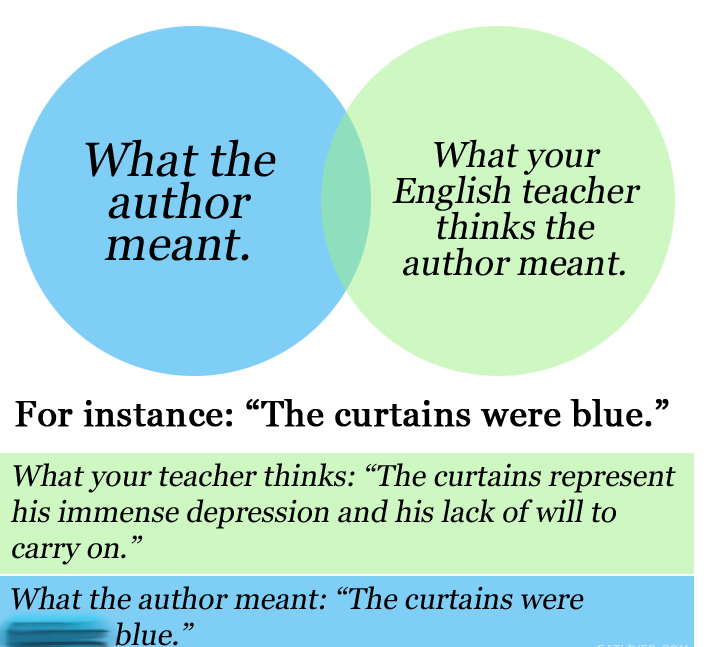 So, the big question: What do blue curtains mean? For more posts on interpretation, click here.